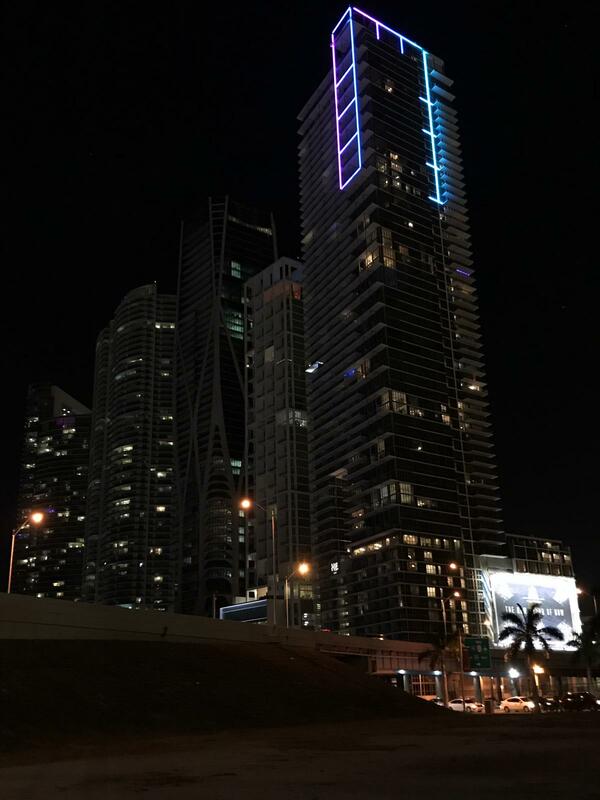 At the top of downtown Miami’s Marquis tower, over 2000 linear feet of color changing LED strips have been installed and are now visible for miles around. The 63-story Marquis was built in 2008, and originally had a solid white lighting scheme in place at the top of the tower. Those lights became inoperable in 2013 due to technical malfunctions. 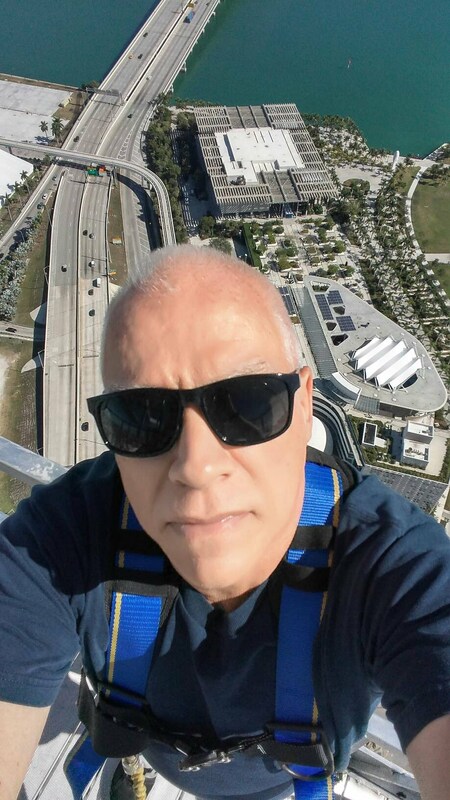 Jim Morrison, a Miami-based lighting designer, created the colorful new scheme as a replacement. The new system follows the exact shape and form as the original design, arranged in dual lines. Morrison’s other work includes A Celebration of Light, which features palm trees ringed with light at the Miami Beach entrance from the Julia Tuttle Causeway. That installation was meant as temporary when built 20 years ago, but remains in place today and was recently replaced with LEDs. At the Marquis, condo President Allan Schwartz and the ownership of the hotel located on the lower 14 floors of the building hired Morrison to complete the new installation. Other recent enhancements at Marquis include a complete renovation of the ground floor, the outside landscaping, and the traffic circle entrance, which includes the Marquis signage and lighted water wall. Marquis was the third tallest building in Miami at 679 feet when it was built in 2008. It is now the fifth tallest. The Signature Bridge is now under construction next to Marquis, with completion expected in four years. Who remembers this site with a Howard Johnson on it? I do. They had a bar in the lobby there in the late 90’s and the bar tender was super old. Wow, a blast from the past. I watched it be imploded from my 34th floor condo at the Grand… I should still have it on video….somewhere. Yes, i stood on top of HoJo and took a Panoramic movie when Covin announced Ten Museum. The Performing Arts Center was still under construction. It looks like they didn’t finish it, although it does look better than it did before. This is SO OLD news — cmon guys we saw the lights like a month ago! it looks totally random. what is the shape supposed to be ? an M? looks unfinished depending on what angle you see it from. i agree, changing colors reminds me a people that put those changing lights in their pool for a party — que tacky. Love it! Given that almost all of our towers are new in Miami, the local council should look to encourage these themes. The private sector is already doing its part with most of Brickell beautifully lit up at night (and of course the OG lit up building – the Miami Tower in Downtown). What are everyones views on color changing LED’s on highrise ? I love them but hope every building don’t do it. Changing colors cheapen an otherwise interesting design. Those diagonal lights on the backside added about a year after completed really cheapened it. the design that you cant see at night anyway? Not that interesting. Poor design. Reminiscent of bicentennial park across the street. (economy hampered). These led lights are old news. They have been operational for more than two months. The height of this tower is 699 FT AGL, NOT 679 FT AGL. It’s about the same height as Zaha Hadid’s new tower next door at 706 FT AGL. Why do they need to change colors and use every color of the rainbow? Looks like a mass produced cheap chinese toy. What is wrong with minimal and elegant look?? Does everything in Miami has to be sooo Miami?? In a decade this building lighting and others will look like a Neo-80’s movement!! Tacky tacky! Tacky tacky rumbaaaaa! See it every night from Sunset Harbour, looks like it’s incomplete. Horrible! What a putz. And he acts like he invented driving value into condo units. ? Airline pilots hate them, they are drawn to these lights like moths to light.